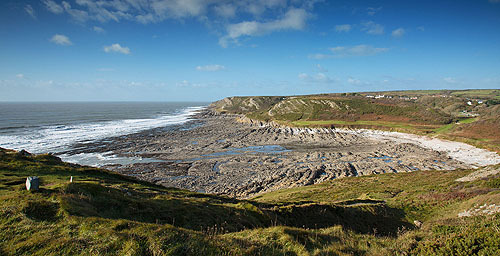 An impressive wave cut Limestone platform is exposed in this bay at low tide. The remains of a Dutch Tug boat ,"Wittezee" , wrecked in 1940, can still be found amongst the rocks. Blue-Green Cobbles can also be found , the ballast jettisoned when the Boats from Devon came to load Limestone from the Quarries. The mere is part of a Welsh Wildlife Trust Reserve with Hawthorn and Blackthorn scrub, mixed Gorse and Heath, Quarries , Limestone Scree .